This fine and accomplished disc was released on LP in 1982 and now reappears courtesy of Arts. 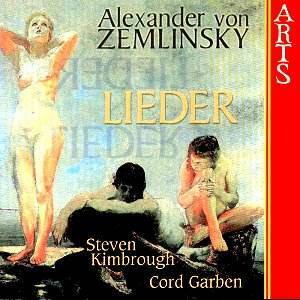 Checking in the near-current catalogues several songs are still not generally available on other discs, which makes their reappearance here a matter of enthusiasm for Zemlinsky enthusiasts. The corollary of the vinyl origin is the relatively short playing time. Nevertheless I think we can allow the difficulties of suitable couplings, not least when this collection makes for such a satisfying programme in its own right. The selection runs chronologically from Op. 2 to Op. 27 and the Brahmsian influence is strongly heard in the earlier settings. Though commentators often say that this was an influence that became quickly supplanted or superseded by a post-Wagnerian canvas and harmonic palette, it seems to me � or perhaps I�m straining over hard to hear it � that the early influences remained audible even into the magnificent Op.13 lieder. At any rate we can all agree that Heilige Nacht and Vor der Stadt are explicitly Brahmsian and that Schlaf nur ein! generates similar imperatives. The Brahmsian impulse seems overpowering and the subtlety of the performance lies in Kimbrough and Garben�s realisation of it. Kimbrough�s is a light-ish baritone, sometimes almost a low tenor, but its agility means he�s able to employ sensitive mezza voce in a way that is quite unselfconscious. It�s with the Op.7 set that things become more harmonically complex and Liebe Schwalbe burgeons into passionate declamation, the piano mirroring and shadowing the vocal line, the two adding hints of Tristan and Isolde. Much the longest setting is Turmwächterlied which, for all its relative increased complexity, still seems to retain Brahms� stamp � allied to a real sense of drama and sweep and quasi-operatic power. I�m not aware of many other recordings of the Op.22 songs, especially the two ones here, but the duo certainly get to grips with the malignity of Elfenlied and they go to town with the Afrikanischer Tanz. The notes are reasonable and the texts are in German only. The recording quality back in 1982 was a touch constricted but the performers overrode that with real conviction.